Kailua Ohana Escape, a secluded hidden gem, steps away to beautiful Kailua beach with private beach access. 3 bedroom, 3 bath family retreat. A secluded hidden gem, steps away from the beautiful Kailua beach with private beach access. Kailua Ohana Escape is a 3 bedroom, 3 bath family retreat and can comfortably fit 8 people with 2 bunks, a king, 2 queen bed and 1 single bed. One bedroom comes with AC, other bedrooms have either a ceiling fan or a powerful movable fan. Kailua Ohana Escape is located near the end of a private road, just one house back from the beach with a private gate and path that is a 1min walk to the sandy shores of lovely Kailua beach. Shops and restaurants are a close walk or bike ride away, as is the famous Kalapawai market, which is nice to walk to for a morning coffee. The house is a 3 bedroom, 3 bath family retreat and can comfortably fit 8 people with 2 bunks, a king, 2 queen, and a single bed. The house has a great lanai, with comfy rocking chairs and a hammock that overlook a tropical landscaped garden. There is an outdoor dining area, big BBQ, and a Jacuzzi for great outdoor entertaining. Kailua Ohana Escape is a one story 2800 sq ft, house on a quiet private lane, with a 1 minute walk to Kailua beach. The house has bamboo and tile flooring, double-pane windows, 3 bedrooms, a 375 sq ft lanai, and gazebo with dining table. ATM, Post Office, Internet Cafe, Bike paths, Golf Course, Movie Theatre, Restaurants, grocery stores (Foodland & Whole Foods) Near Hiking Trail, Horseback Trails, Wind surfing, surfing, swimming, fishing, snorkeling, diving. Our Ohana lives in Kailua and is very responsive. You will be welcomed upon checking. At Kailua Ohana Escape you hear the surf at night. If you're looking for an out of the way Hawaiian vacation rental, walking distance to Kailua Town and the beach, look no further. We are located in a lovely neighborhood in the nicest place on earth. Seven golf courses in a five-mile radius, tennis courts, an Olympic-sized pool, fabulous beaches, activity adventures, exciting shopping, and gourmet dining -- Kailua has everything; two and a half miles of white sand beach with no hotels, resorts, time shares or beachfront condos. This is affordable paradise. 3 bedroom 3 bath home with BBQ and a Jacuzzi for great outdoor entertaining. I don't want to give a good review for fear the house won't be available the next time we it, but that would be selfish! The house is beautiful and a perfect retreat for one family of four, kids ages 9 and 14, and a family of three with a baby. All three bedrooms are large, with private bathrooms. The living room and dining room are an open space that worked well for everyone. The kitchen is well-stocked (although we wouldn't object to sharper knives!) and we appreciated having spices and some pantry basics on hand. The house is nicely decorated. The beds and other furniture are comfortable and there were plenty of bath and beach towels. The master bedroom has an air conditioner, but the overhead fan worked just fine (along with lots of open windows) in the other "grownup" bedroom. The kids' room (with two sets of bunk beds and one extra bed) has two fans, one of which sits nicely in the window to bring in the breeze. They provided small bars of soap, but you want to buy your own if you are staying for more than a few days (it takes a lot of soap to get sand and sunscreen off!). There was a random selection of leftover shampoo and conditioner, which worked fine for us, but you might bring your own if you are picky about that kind of thing. They give you everything you need to keep the kitchen clean. You'll need to buy your own laundry detergent, but that is totally normal for every place we've rented in Hawaii. The lanai is to die for! 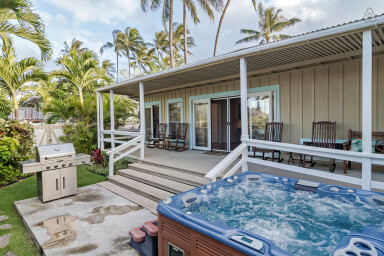 Chairs, a couch and chaise lounges all look out into a cute yard with a hot tub, which you initially think you won't use because, well, it's hot in Hawaii. But, you'd be wrong. It is quite delightful to lounge in a hot tub after a long day at the beach. Just make sure to wash all of the sand off first! I think the best part, though, may be the 20 second walk down your private path to the most beautiful beach I've been on. Perfect sand, great waves, not too many people. You can't ask for more. We had the pleasure of spending 8 days at Kailua Ohana Escape. This home was perfect for our family! The location is incredible...when you walk through that private gate you are just steps from the most beautiful, quiet part of Kailua Beach. It's just breathtaking! The back yard grilling area with seating under the gazebo and a hot tub nearby, was perfect for our family meals. We kept the hot tub at the set temp of 94 (can be hotter if you want) & it was perfect and refreshing after a hot day at the beach. The setup of the house is great as well. Three separate suite areas, each with it's own large bathroom. Plenty of room to spread out, plus a beautiful kitchen/dining/living area to relax in. The kitchen is very well equipped. It provided everything we needed! There are tiny ants to deal with, but that is normal in Hawaii. I just kept the counters & tables clean and it wasn't a big deal at all. We truly enjoyed our stay here & will look here first when we're back in the islands. Beautiful home in a great location. Everything you need is in the house. Private path to the beach!